Most Premier League stadiums play music as players walk out of the tunnel. Beyond YNWA and the other classics, there are some really weird ones. At the end of a storm, there’s a golden sky and the sweet silver song of a lark. 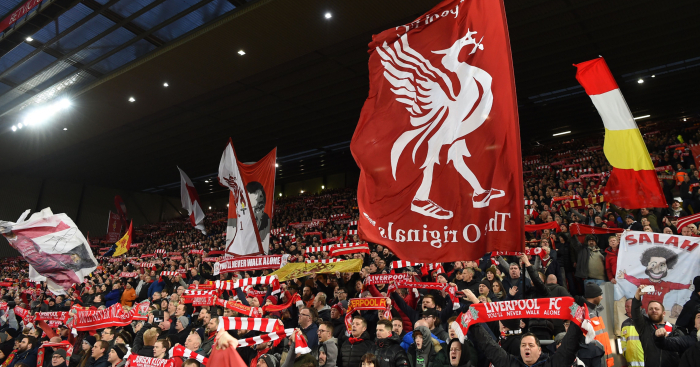 That’s what Liverpool fans tell you as they sing ‘You’ll Never Walk Alone’ before kickoff, but is it true? If a storm is moving away from Newcastle at around 3PM on a Saturday, it’s actually soundtracked by a song by Mark Knopfler. If the clouds have gathered above wherever Tottenham happen to be hosting football matches, it’s a song from the Star Wars franchise. Things are weirder still at Arsenal. The world of football walk-on music is a strange and illogical place, full of forgotten television theme songs, dad rock and wildly inappropriate film scores. But these easy-to-recognise, hard-to-name tunes are an integral part of the Premier League experience. Here they are, from worst to best. Z-Cars was a BBC police drama in the 60s and 70s, and its jaunty theme tune is inexplicably used as walk-on music at two Premier League clubs. The baddie music from the Star Wars prequels is played when Darth Maul kills Qui-Gon Jinn, and also when a mascot gets to hold hands with Son Heung-min. Tottenham are great, but they’re not scary, which makes this a pretty terrible choice of entrance music. They should try the ‘Cantina Band’ song instead. One of a handful of songs used at St James’ Park, this saxophone-heavy jam from the Dire Straits frontman was written for the film Local Hero. I spent five minutes watching laggy pre-match footage of Bournemouth-Watford, a lot of which was Troy Deeney chatting to a young mascot, only to find that the Vitality Stadium didn’t play any music at all. Maybe this isn’t normal, and a few forums have suggested that Fatboy Slim and Kasabian have been played at the ground, but I’m not spending any more time researching it. On the flip side, crowd chatter is better than ‘Z-Cars’. Karl Jenkins’ unnerving string composition is presumably played to fire up Fulham’s board of directors — so they might sign more rubbish forwards like Ryan Babel. Unfortunately, intimidating music sounds silly when your team is this bad. Confirmed banger, but lyrics about ‘a girl consumed by fire’ make this a weird one. It also gets really quiet at some points — a bit like Old Trafford. Southampton’s second-best song about saints, this punk number from 1979 has been covered by U2 and Green Day. St Mary’s seems to be mixing it up with some dancier stuff this season, but the south coast side are in no danger of relegation from the league of pre-match music. A functional but uninspired choice that is used by many a team. No points for originality, and only a few for atmosphere. In the past, Cardiff have walked out to different versions of a mining folk song called ‘When The Coal Comes From The Rhondda: I’ll Be There’, which was later covered by a Welsh pop-rock supergroup called The Stand. Objectively one of the coolest tunes on the list, Chelsea’s pre-match anthem has historically been associated with skinheads, who weren’t so cool. Still, the way the fans work in ‘Chel-say!’ is good. Weirdly, this song was actually written about the team, and contains wholesome lyrics about pride, goals and ‘bells ringing merrily’. Selhurst Park is great, and this kitsch 60s number has soundtracked too many Alexander Sørloth wondergoals to even count. Arcade Fire have definitely never been to Lancashire, but this one has a good mix of passion, grandness and long sections that go ‘whoaaaaaaaa, ohhhh, whoa, oh, oh, oh’. A pop standard written in the 1930s, ‘Blue Moon’ has been sung by City fans since the 1980s. They might have nicked it from Crewe Alexandra, but that doesn’t make it any less effective. Continuing the tradition of incredibly unthreatening-sounding songs associated with crowd naughtiness, West Ham’s anthem is one of the Premier League’s most iconic entrance songs. Well, it is appropriate, isn’t it? The unofficial ‘county anthem’ of Sussex is sung at Brighton home games, as well as Sussex county cricket matches. The Emirates Stadium has, for a few seasons now, been playing this string quartet piece to welcome its players onto the field. If Spurs are going to use music from a space fantasy film, why wouldn’t Arsenal use music from a film like Requiem for a Dream? Spoiler: Requiem for a Dream is a film in which two lovers are driven apart by heroin addiction, which ultimately causes the male partner (Arsenal?) to get gangrene in his arm (Wenger? ), which eventually has to be amputated by a surgeon (Sir Chips Keswick?). The female partner (Arsenal fans?) turns to prostitution (ArsenalFanTV? ), while the man’s mother (Sven Mislintat?) struggles with an addiction to prescription amphetamines (Henrikh Mkhitaryan’s misplaced passes). Lineker. Ranieri. Vardy. There’s lots to like about Leicester, but few things about the club are quite as charming as this odd little horn ceremony that has been greeting the matchday squad since the 1930s. The LCFC Posthorn community even has its own website, which has definitely been updated since 2013.